Everything you need for perfect clarity glass! Meguiar’s Perfect Clarity Glass Care Kit uses two products to deep clean your glass and remove water spots, as well as protect and repel rain and water for months – all in two easy steps! Meguiar’s Perfect Clarity Glass Polishing Compound uses microscopic abrasives to gently remove stains, grime & water spots that glass cleaners leave behind. Meguiar’s Perfect Clarity Glass Sealant protects your newly cleaned glass surface and improves your overall visibility for months! 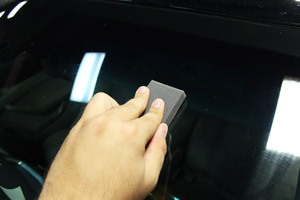 Having dirty and smeared glass windows and front and rear windshields is more than just an eyesore. It can also be very dangerous! If you don’t have perfect clarity in your windows and glass extreme driving conditions like rain and sun glares can cause an accident. Meguiar’s Perfect Clarity Glass Care Kit takes care of each step needed for perfect glass! 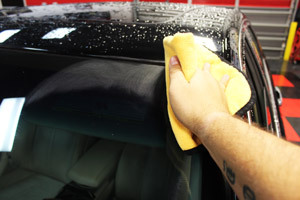 Meguiar’s Perfect Clarity Glass Polishing Compound is a deep cleaning formula that removes stains and grime that traditional glass cleaner can leave behind. Even hard to remove stains and residue are no match! Using advanced micro-abrasives, Meguiar’s Perfect Clarity Glass Polishing Compound helps restore the clarity in your neglected, grimy glass surfaces and prepares glass to be treated with Meguiar’s Perfect Clarity Glass Sealant. First, remove stains and grime from your glass using the Meguiar's Perfect Clarity Glass Polishing Compound and the yellow Meguiar's applicator. Once the surface contaminants are removed, use a microfiber towel to buff away excess product. Once your glass has been cleaned, use the gray foam block applicator to apply the Meguiar's Perfect Clarity Glass Sealant. Once the application is complete you have cleaned and protected glass for months! Just as the name implies, Meguiar’s Perfect Clarity Glass Sealant protects your paint and repels water making your glass easier to clean and maintain. Thanks to highly durable polymers in the Meguiar’s Perfect Clarity Glass Sealant formula, an invisible barrier that repels rain is formed. 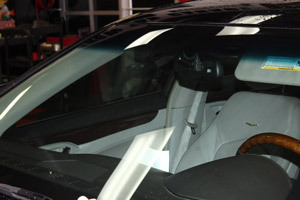 This makes oil and grime easier to remove and dramatically improves wet weather driving visibility. Meguiar’s Perfect Clarity Glass Care Kit also includes two applicators, one needed for each product, so just this one kit gets you the perfect window and glass clarity you always needed!